I love pumpkin seeds, and after buying ingredients for my trail mix, I had lots of pumpkin seeds left over. (Okay, so we might have gone a bit overboard – we bought a kilogram of them). As is true of most seeds, pumpkin seeds have a very high nutrient content that includes magnesium, manganese, copper, zinc, protein and antioxidants. They are also good for your children because they are high in Omega 3 and 6 which contributes to healthy brain development. They even have some anti-microbial properties. In short, they are pretty amazing. They do have a bit of an odd taste, however, which some children might not like. I like to toast mine with healthy coconut oil, some salt and spices. 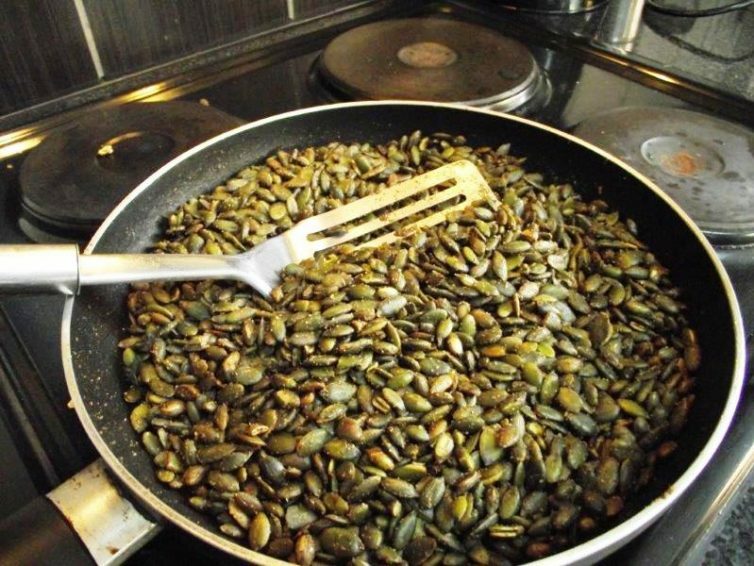 The following recipe is how I like to toast my pumpkin seeds, but you can use whatever spices your family like best (I can imagine they taste amazing with onion flakes). I put a little cayenne pepper in for some heat, but you might want to omit this altogether if your children don’t like spicy food. And as always, this recipe makes an excellent lunchbox addition. This is also great sprinkled on salads.